7 1/8 x 7 x 5/8 in. The death of two friends from AIDS in the early 1990s sadly inspired this work, with its theme of decay. In this volume of exquisite facsimiles from the Hermitage Museum in St. Petersburg, a corrosive force seems to have eaten away these representations of the human form, ultimately destroying them. I created this effect by manipulating a belt sander, as a drawing implement, to grind away at the images in ovular shapes that reference cameo portraits in both photography and painting. 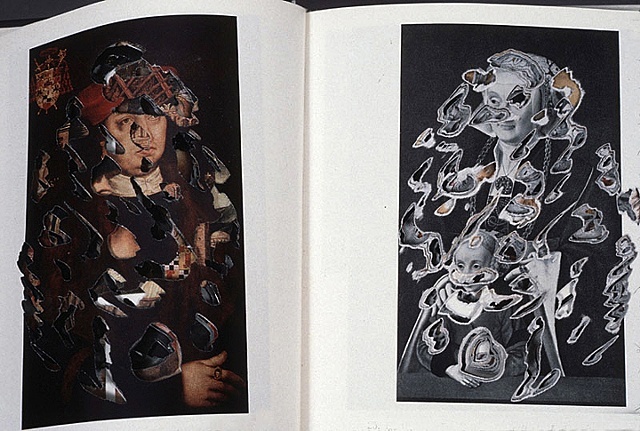 However, instead of capturing the likeness of a human physiognomy within the elliptical field, the alteration ends up eradicating the image, as if a virus has been feeding on the ink and paper. Compounding this metaphor of fatal illness, here also is figuredby disfigurementa non-computer virus to which the material works of human culture are subject.